Driving in and around Oxford has long been an inconvenient experience. Various measures have been introduced over the years; blocking off access to some roads, restricting traffic on others. It is perhaps fortunate that the most ambitious of post-war planning never took place, considering the destruction that would have been caused to some of the prettiest parts of the city. 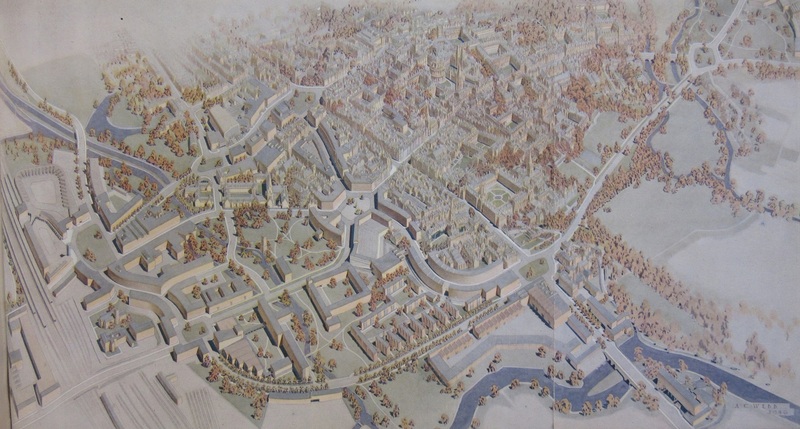 Oxford Replanned was a scheme devised by Thomas Sharp, a planning consultant to the City Council, after the 1939-45 war. Sharp was appointed following work in a number of areas destroyed or damaged during the Blitz. Designed to take traffic away from the High Street by building new roads to the south of Merton College through Christ Church Meadow and then linking up with the Botley Road via a new layout of roads and squares between Queens Street and the Railway Station, the scheme was controversial from the start, something that Sharp himself predicted. In his book ‘Oxford Replanned’ Sharp states in the introduction ‘The task has proved to be an onerous one, and now it is completed I cannot with certainty expect that the result will be generally acceptable even in its main features, let alone in all its details. indeed I know very well that some of the suggestions I make will rouse bitter opposition in some quarters’. The Oxford Times were keen supporters of the plans, even though they could see the reaction the plans would cause, “further outlook stormy”, was their prediction as early as February 1948. Overview of the city, from ‘Oxford Replanned’, 2479115 d.77. Magdalen bridge which would take a new road from the Plain over the river and through Merton Field and Christ Church Meadow. This would then link up with a square south of Christ Church and then leading onto the Railway Station and Botley Road. For Sharp there were two main benefits to this scheme, the easing of traffic through the High already mentioned and the clearing of the slum areas around the castle. Sharp also envisaged a new building programme, with schools, council buildings and housing centred around public squares where previously there were slums and narrow streets. As can be imagined Sharp’s plans were met with some opposition, though many recognized the need to improve the traffic issues that were apparent even then. Sharp appeared at a number of meetings throughout 1948 as his book was published and an exhibition of the proposals was held in the City. Most memorable was the an Oxford Union debate on the 4th of March, which was disrupted by the letting off of smoke bombs, though this seems to have been a student prank than any protest as a motion to support the plan was carried 173 votes to 50. The new proposed layout overprinted onto an Ordnance Survey 6″ map of the city. (R) C17:70 Oxford (246). As can be seen in this map Sharp proposed major changes to the layout of the city to the north of the High Street as well as the south. 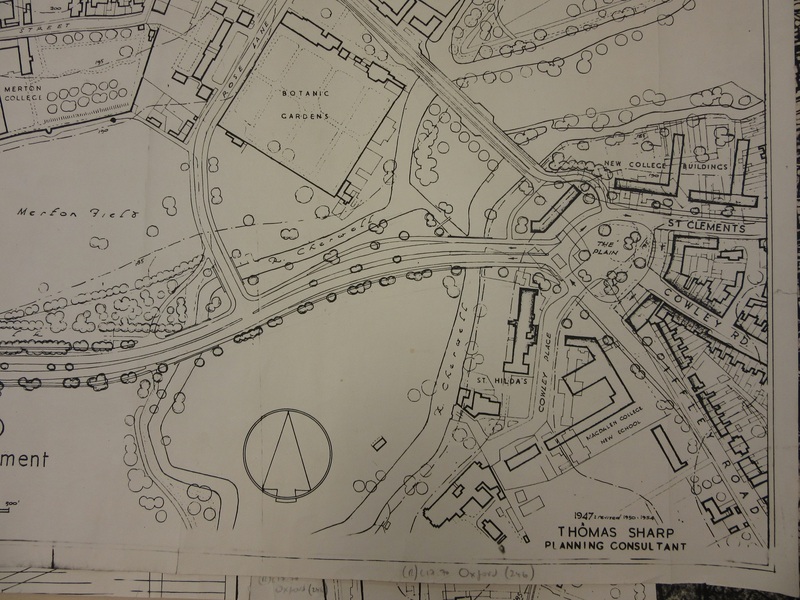 Sharp’s plans updated those of Lawrence Dale, who published a book in 1944 called ‘Towards a plan for Oxford City’. Like Sharp Dale wanted to move traffic away from the High Street, though Dale doesn’t seem to have any connection with the Council or planning in general. His book is a mixture of strange motives, his plans seem to have been born out of frustration at an attempt to fly a kite on Christ Church meadow in 1942 thwarted by a notice at the entrance banning beggars, those poorly dressed and those flying kites from entry, while amongst his more outlandish ideas is the moving of the University out of Oxford to the estate at Wytham, leaving the college buildings to tourists and soldiers on leave or wounded from fighting in the war. As can be seen from a plan made by Dale his road goes nearer the river than Sharp’s proposals. 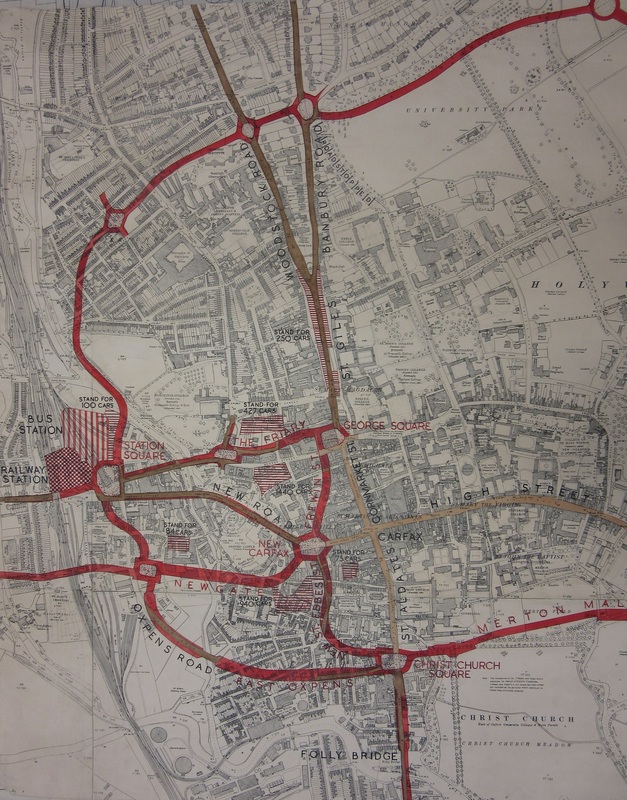 The pictures shown throughout this blog are a mixture of maps and plans that were made for the production of a book written by Sharp in 1948 that sets out his proposals, ‘Oxford Replanned’. This book is a treasure trove of old photographs, plans and pictures and writings both of the city as it was immediately post-war and of how it could be if Sharp’s proposals were accepted. 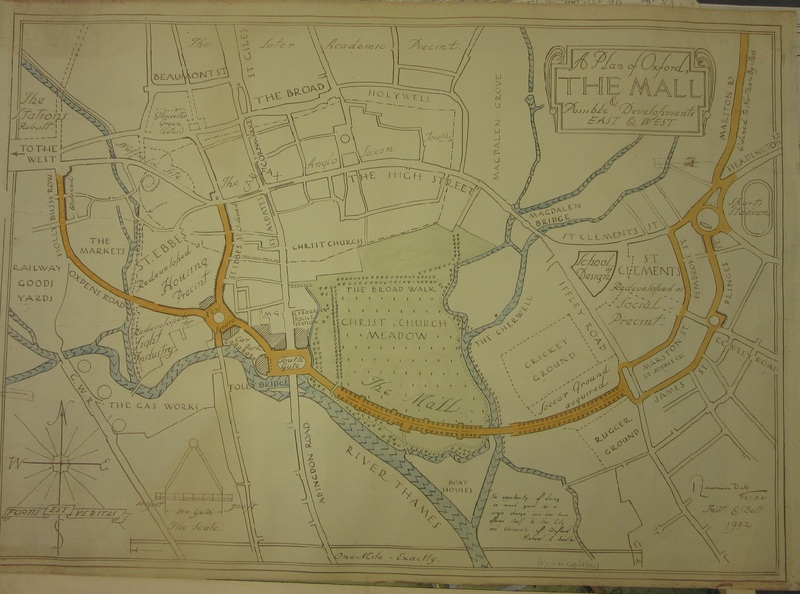 The maps and plans are in a number of different formats and media, and have recently undergone valuable conservation work, as some of the material, particularly the dyeline paper mapping and heavily painted plans, were not that stable. 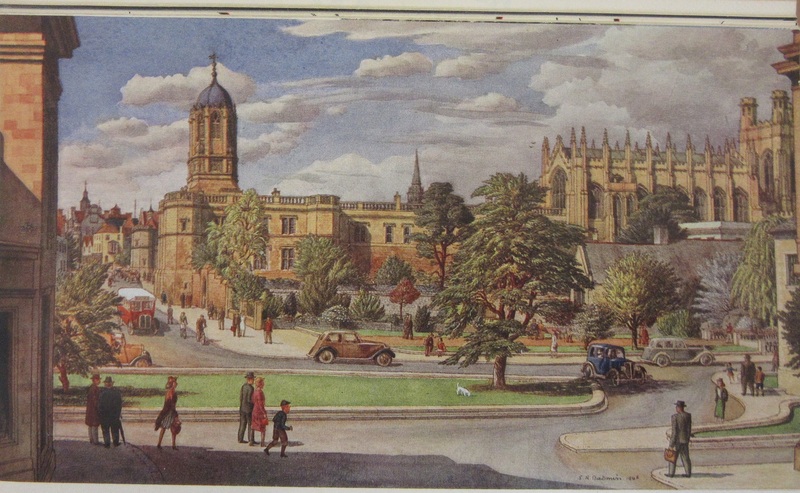 The proposed square linking the new road from the Plain with the Railway Station, from ‘Oxford Replanned’. Ultimately Sharp’s plans were rejected. Who’s to say we’re better off now without them? People can walk in the beautiful grounds of Christ Church and Merton unimpeded by road traffic, fumes and noise but at the same time the High Street is often clogged with traffic and the infrastructure of the road suffers from the traffic on it. 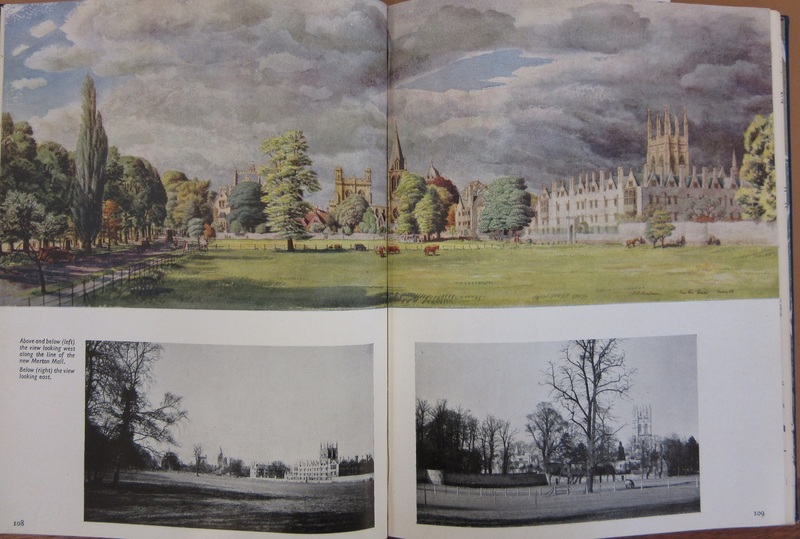 Page from ‘Oxford Replanned’ showing an idealistic view of the proposed road going through Christ Church Meadow. This entry was posted in Oxford on 21 April 2017 by stuart.